Evelyn Fern Buller, age 93 of Newton, KS passed away March 31, 2019 at Comfort Care Home in Newton. Evelyn was born August 25, 1925 at home north of Walton, KS to David and Carolina (Voth) Reimer. Evelyn graduated from Walton High School in 1944. On April 6, 1946 she married Raymond Buller at the Tabor Mennonite Church. This union was blessed with five children. Evelyn loved sewing and sewed dresses for her and her daughters including the girls wedding dresses. She also liked to quilt. Evelyn enjoyed gardening, canning and baking, and took great pride in her shelves of canned goods. Evelyn was a member of the Zion Mennonite Church in Elbing. She is preceded in death by her parents, David and Carolina; husband, Raymond; and brothers, Wilbert and Jonah Reimer. 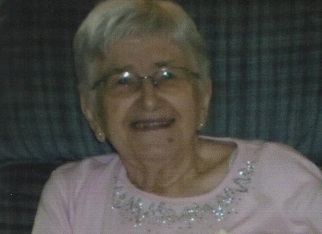 Evelyn is survived by her sons, Duane Buller and wife Melody of Hesston, Kenton Buller and wife Barb of Newton; daughters, Elaine Epp and husband Roger of Monet, MO., Raeanne Wiebe and husband Randall of Peabody, KS, Karen Esau and husband Gary of Lincoln, NE; and brother, Richard Reimer, 13 grandchildren and 23 great-grand-children. Visitation will be held Sunday, April 7, 2019 from 1:00 pm to 5:00 pm at Petersen Funeral Home. Memorial Services will be Monday, April 8, 2019 at 11:00 am at the Zion Mennonite Church in Elbing. Burial will precede the services at 10:00 am at Zion Mennonite Cemetery. Family suggests memorials to the Mennonite Central Committee and may be sent in care of the funeral home. We loved Uncle Ray and Aunt Evelyn. Thinking of all the cousins at this time.